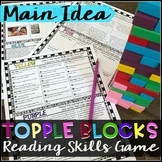 Main Idea Game - "Shoots and Ladders"
Mystery Message Main Idea Game! 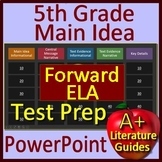 This is a Reading Center for "Main Idea", have the students work in groups to figure out each main idea of each paragraph. This is a quick way to teach children to read careful and look for clues to be able to find the main idea of each paragraph. 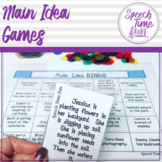 In this game, students use background knowledge and association skills to figure out the common theme among the pictures.This game can be played as a whole group and then later set up in a literacy station for further practice. 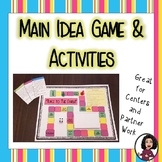 Its recommended to copy and make a set of the game cards on cardstock. The student identifies the main idea related to three given words. This game can be played in a small or large group. By playing in smaller groups, each student has more cards. 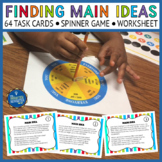 This raises the individual accountability, activity, time on task, and reinforcement opportunities per student. In this game, the student must identify the main idea for the given clue. This game can be played in small or large groups. By playing in smaller groups, each student has more cards. This raises the individual accountability, activity, time on task, and reinforcement opportunities per student. The student must identify the main idea for the given clue. The game can be played in a small or large group. By playing in smaller groups, each student has more cards. This raises the individual accountability, activity, time on task, and reinforcement opportunities per student. 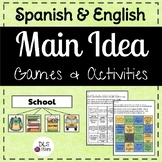 Also included in: Main Idea Activities Bundle! 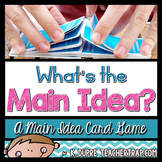 The student must identify the main idea for the given detail. 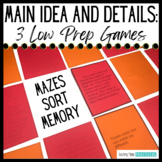 This game can be played in small or large groups. By playing in smaller groups, each student has more cards. This raises the individual accountability, activity, time on task, and reinforcement opportunities per student.